CBS: BIG BROTHER: CELEBRITY EDITION dropped 0.1 from Wednesday’s episode to 1.0. Reruns followed at 0.5/0.5. ABC: FRESH OFF THE BOAT (0.7) and SPEECHLESS (0.6) were steady, and 20/20 gained 0.1 to 0.8. NBC: A FIGURE SKATING US CHAMPIONSHIPS special was at 0.4. FOX: After reruns at 0.6/0.5, HELL’S KITCHEN held at 0.7. 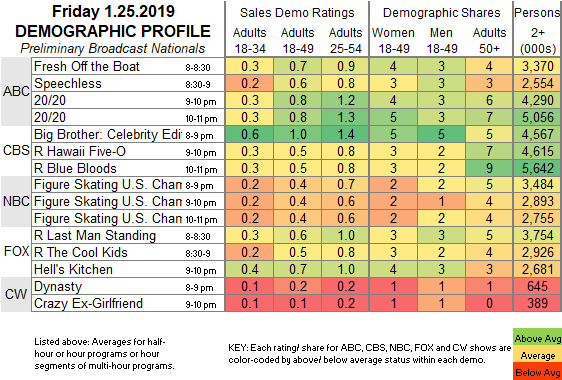 CW: DYNASTY stayed at 0.2, and CRAZY EX-GIRLFRIEND fell 0.1 to 0.1. Tonight is a heavy sports night on the networks, with the NHL ALL-STAR GAME on NBC, BOXING on FOX and an NBA game on ABC. SNL is hosted by James McAvoy, with musical guest Meek Mill. On Sunday, FOX airs its live version of the musical RENT, and both TNT and TBS carry the SCREEN ACTORS GUILD AWARDS.